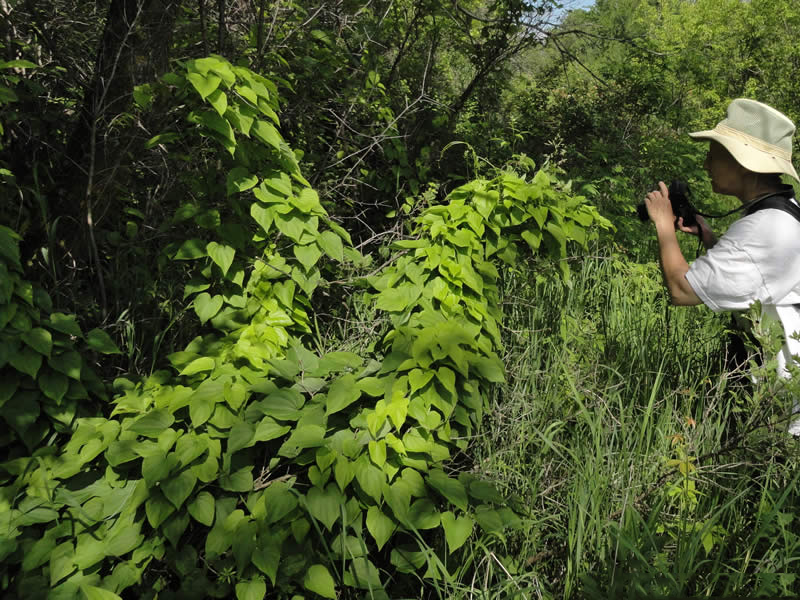 Wild Yam is a perennial, twining, tuberous climbing vine that grows about 15 ft. tall. The plant is found growing in thinly wooded bluffs, typical savannas and sandy savannas, woodland borders, typical thickets and sandy thickets, moist sand prairies, power line and railroad clearances in wooded areas, and fence rows, borders of bogs, swamps, marshes, river and lake margins, creek bottoms, rocky soils, moist or dry woods, hammocks, limestone or talus slopes and roadsides. The plant grows abundantly in a wide variety of soil types, including light, medium, and heavy soils that are well-drained. It cannot grow in the shade and requires moist soil. The plant has long, branched, crooked, and woody root, the taste being dull, afterwards acrid. Plant has pale-brown, knotty, woody, cylindrical tubers which are light brown outside and white fibrous inside. Stems are little branched, leafy, grooved or narrowly winged, mostly hairless, lack tendrils and twine around other vegetation for support, and spreads by seed or branching rhizomes. Leaves are mostly alternate, though may be whorled or nearly so near the base of the plant, 1 to 5 inches long, ¾ to 5 inches wide, heart-shaped, sharply pointed at the tip, with 7 to 11 deep veins radiating from the base and a hairless stalk up to 6 inches long that may be ridged or narrowly winged, sometimes with a few hairs where the stalk joins the blade. Leaf edges are toothless and sometimes a bit wavy. The upper surface is hairless and the lower variously hairy, sometimes hairless or glandular. Color is light to medium green. 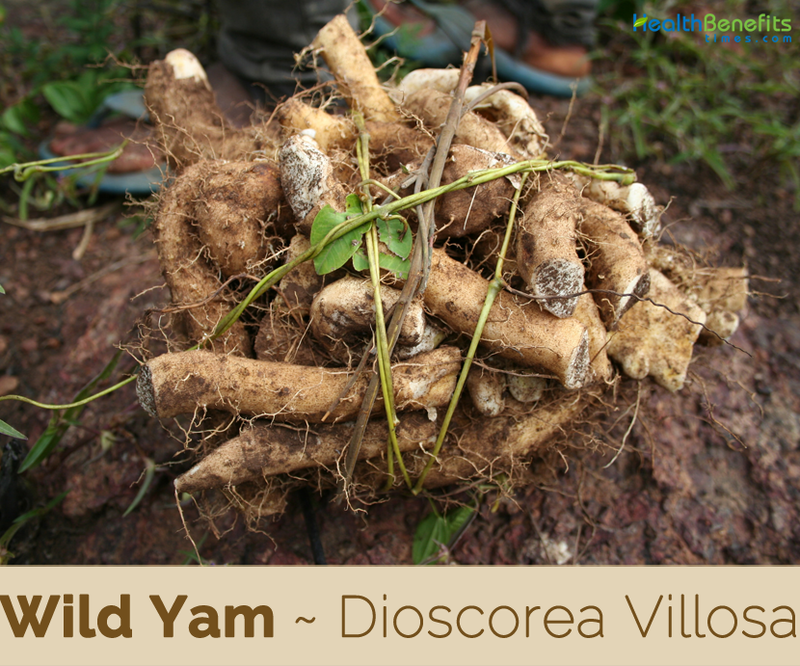 Wild Yam is dioecious, producing vines with either all male flowers or all female flowers. 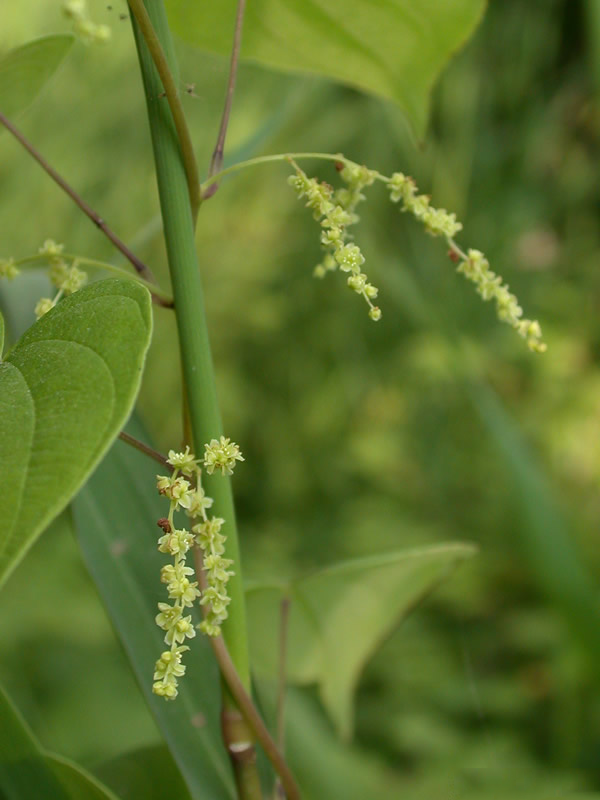 On male vines, panicles of numerous male flowers about 4-12 inches long develop from the leaf axils. Male flowers are arranged in small clusters of 1-3 along the branches of each panicle. 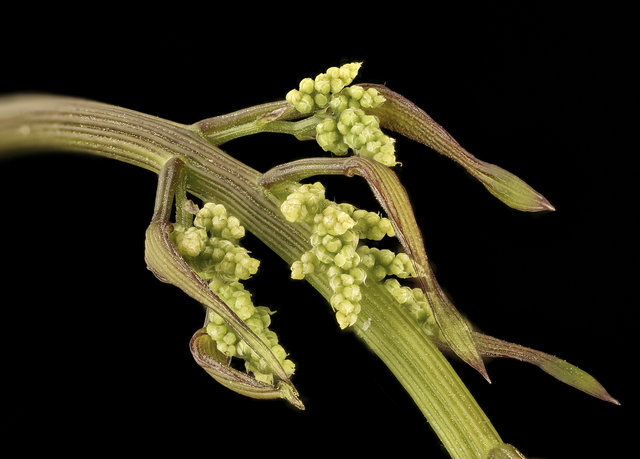 Individual male flowers are about 1/8 inches (3 mm.) across, consisting of 6 whitish green or yellowish green tepals and 6 fertile stamens. 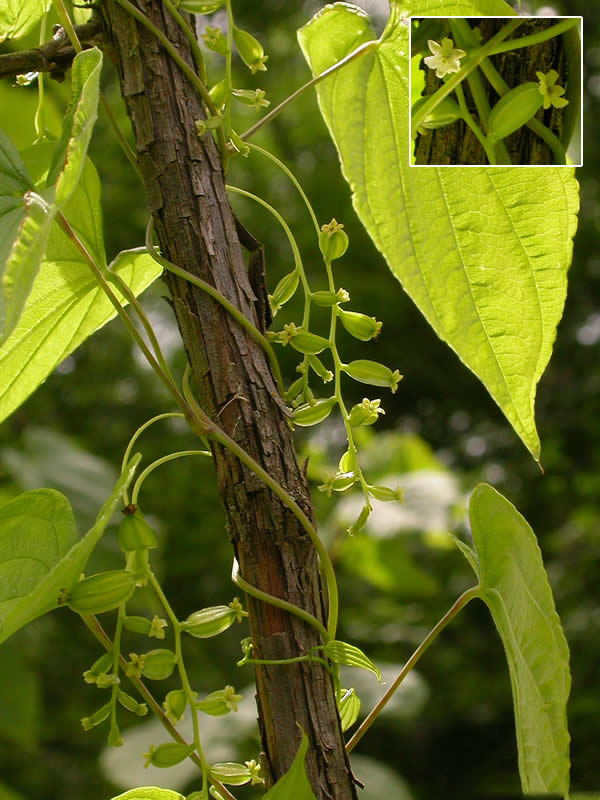 On female vines, racemes of 5-15 female flowers about 3-9 inches long develop from the leaf axils. Individual female flowers are about 1/8 inch (3 mm.) across and 1/3 inches (8 mm.) long, consisting of 6 whitish green or yellowish green tepals and a large inferior ovary with 6 infertile stamens. The blooming period occurs during early summer. The female flowers are followed by 3-celled seed capsules that are ovoid in shape and about 1 inch long. 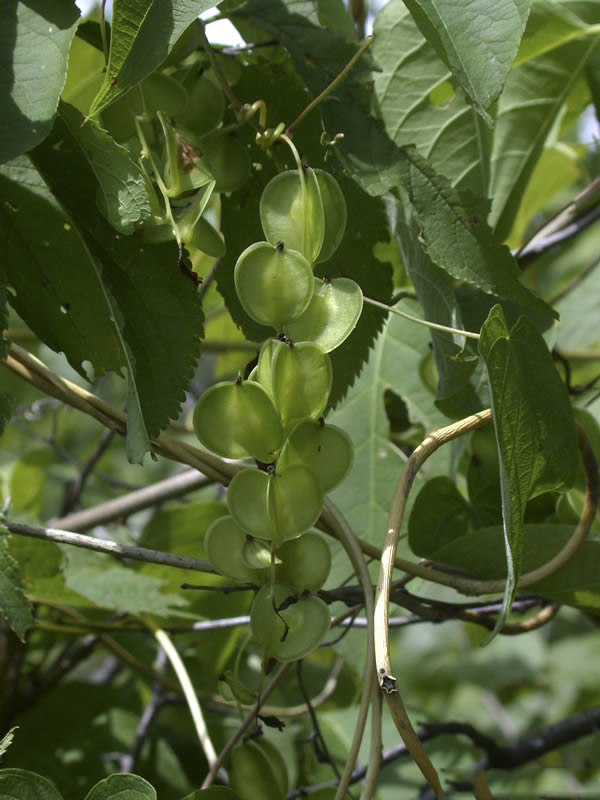 These capsules are strongly 3-angled and become golden green as they mature. Each cell of the capsule usually contains 2 seeds (less often, only 1). 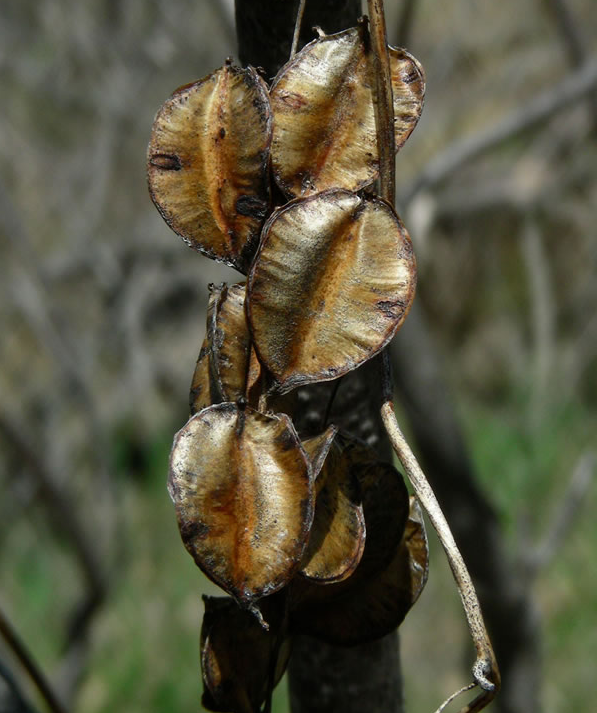 The flattened seeds have broad membranous wings; they are distributed by the wind. Traditional medicine practitioners believe that wild yam has anti-inflammatory properties and use it to treat rheumatoid arthritis. Wild yam may be useful for managing menopause symptoms, though scientific evidence for its benefits is weak at this time. Its strong estrogenic and progesterone-like effects may help to balance hormone swings of menopause and decrease heavy bleeding or unpredictable spotting during peri-menopause. Wild yam may also help reduce irritability, and its anti-inflammatory benefits might offer relief of joint pain that often accompanies menopause. Wild Yam is one of the leading ingredients in most breast enhancement supplements/creams since it encourages healthy breast tissue. Wild Yam does not raise your estrogen levels. Wild Yam Root makes breasts larger by using the natural progesterone. It is famous for balancing female hormones and assists in the natural development of breast growth. Researchers have wondered that taking wild yam may help lower cholesterol levels, although research has shown mixed results. Diosgenin seems to block the body from absorbing cholesterol, at least in animal studies. But in research of people, cholesterol levels have not gone down — although fats in the blood (triglycerides) have decreased. 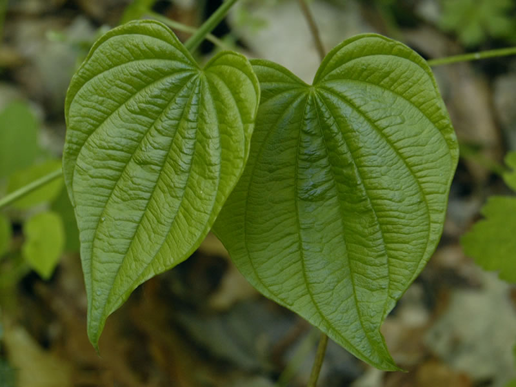 More research is needed to determine whether wild yam would help people with high cholesterol. 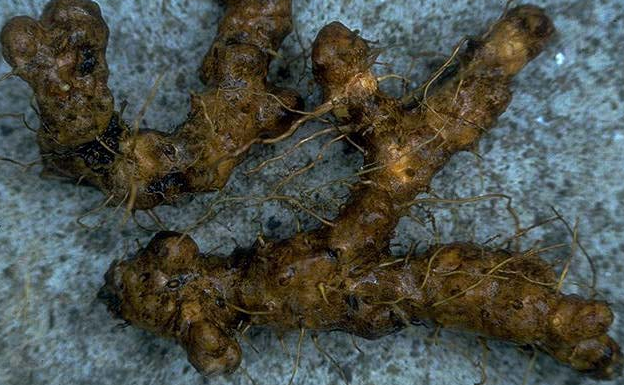 Wild yam roots consist of diosgenin which is extensively used in modern medicine in order to manufacture progesterone and other steroid drugs. These are used as contraceptives and in the treatment of various disorders of the genitary organs as well as in a host of other diseases such as asthma and arthritis. Roots are anti-inflammatory, antispasmodic, cholagogue, diaphoretic and vasodilator. 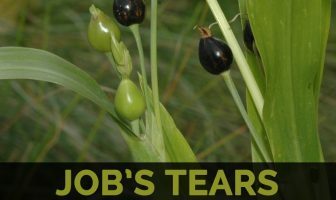 Plant affords one of the best and fastest cures for bilious colic. It is especially helpful in treating the nausea of pregnant women and has been used to ease the pain of childbirth. It is also taken internally in the treatment of arthritis, irritable bowel syndrome, gastritis, gall bladder complaints, painful menstruation etc. Root, harvested in September, is used to make a homeopathic remedy. Its main use is in the treatment of infant colic. It is valuable also in painful cholera morbus with cramps, neuralgic affections, spasmodic hiccough and spasmodic asthma. 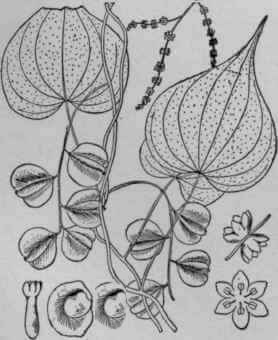 Powder form of Wild Yam can be added to cream or vaginal ointments. It treats Intestinal disorders, Gallbladder Pain, Rheumatoid Arthritis and for increasing Energy. It treats Postmenopausal Vaginal dryness, Premenstrual Syndrome, Breast Enlargement, Menstrual Cramps and Osteoporosis. It increases sexual drive in men and women. 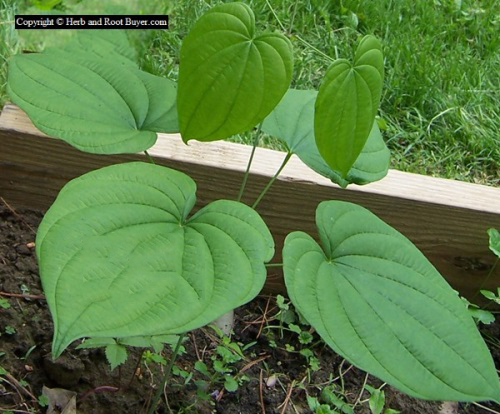 Wild yam is applied topically on skin to treat hot flashes. It regulates the Bile production. It helps to relieve Hepatic Congestion, Bilious Colic and Gallstones. It increases the efficiency of Liver. It lowers the Blood Pressure and Blood Cholesterol level. Wild yam was used as a medicinal herb by the Mayans and the Aztecs, possibly as a pain treatment. Muscle aches caused due to overexertion, injury, etc. can be cured with the inclusion of this herb. Hypertension can lead to a number of health complications like stroke, congestive heart failure and even cardiac arrest. The use of wild yam is known to prevent and control erratic blood pressure. Conjunctivitis and certain skin diseases like psoriasis, eczema, etc. can be treated with the help of the cream made from wild yam extract. It has been found out that wild yam can prevent the formation of kidney stones. Wild yam also aids in the proper functioning of the digestive, excretory and nervous systems. Wild yam encourages the flow of bile to the duodenum, a part of the small intestine. American Indians used a tea made from this root, to relieve labor pains. 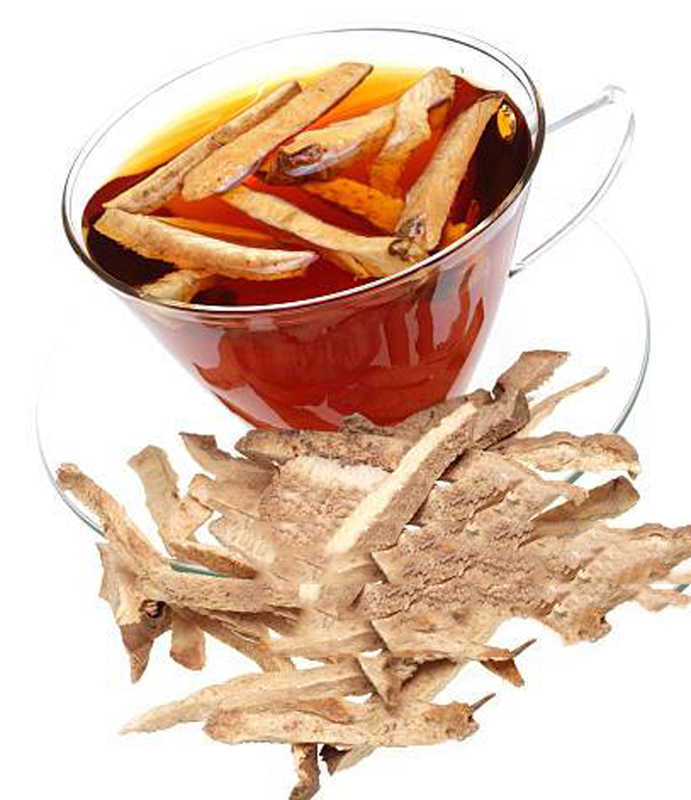 Fresh dried root, made into a tea, is good for morning sickness. Vaginal infections: Mix 3 drops each lavender and tea tree essential oils, 3 cups warm water, 2 heaping tablespoons yogurt. Use it once a day. Prevents Pregnancy: Take 3 cups tea of wild yam daily. Menopause: Massage half a teaspoon of Wild Yam Cream into the soft parts of the body. Increases fertility: Dropperful of tincture 1-3 times a day. Small Breast: Massage the breast with Wild Yam Cream. PCOS: Buy “Dioscorea ” mother tincture and have 10 drops in a glass of water. Have it 2 times in a day. Carpel Tunnel Syndrome: Make a decoction of the Viburnum Opulus, St. John’s Wort, and Wild yam. Take twice a day. Endometriosis: Grind dried root of Chasteberry, Echinacea, Wild yam, Viburnum Opulus in equal quantity. Take Raspberry leaves and Motherwort leaves in half quantity. Prepare a decoction. Strain. Drink one cup two times a day. Muscular pain: Take dried roots of Black Cohosh, Wild Yam and St John’s Wort in equal proportion. Grind them. Prepare a tincture. Take half tsp once a day. Heavy menstrual bleeding: Take 2 tablespoons each of dried Licorice root and Wild Yam root, One tablespoon of powdered Burdock root and Comfrey root, 2-3 tablespoons of Dandelion root. Put these herbs in 4-5 cups of cold water and simmer for 15 minutes in a covered pot. Drink thrice daily for 3-4 months. 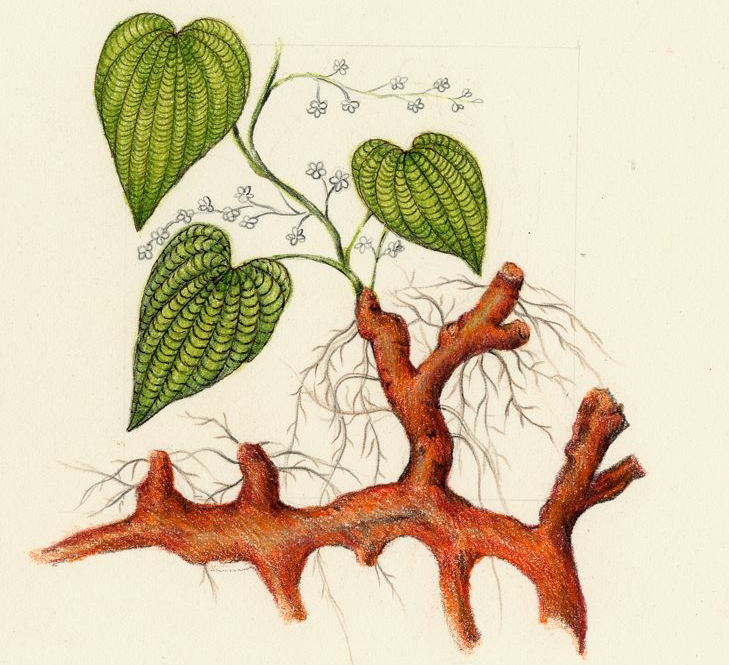 Repeated miscarriage: Tincture equal parts of Mitchella Repens, Black Haw and Wild Yam. Take 10 drops 2 times a day. 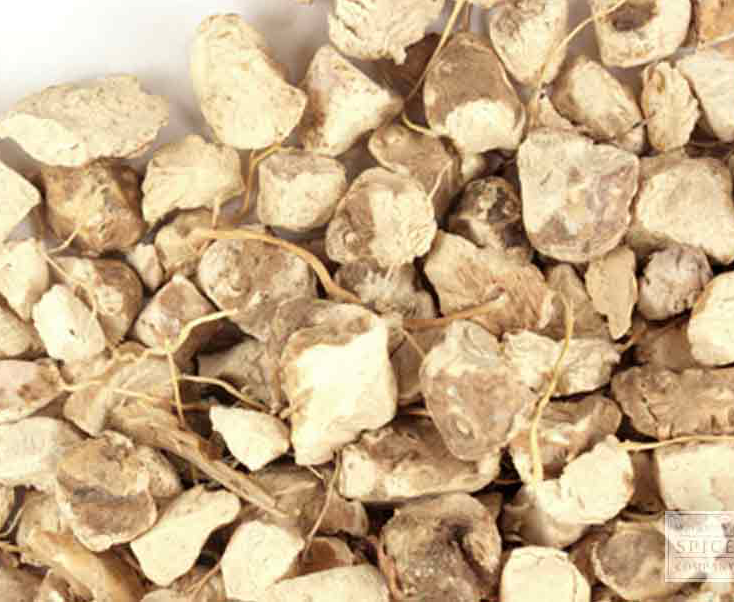 Dried root of wild yam is used to make a variety of medicinal preparations. Wild yam’s dried root can be brewed into a medicinal infusion for relieving premenstrual syndrome (PMS) and menopause symptoms. This is a popular form of wild yam and can be easily added to water, smoothies, or green juices. 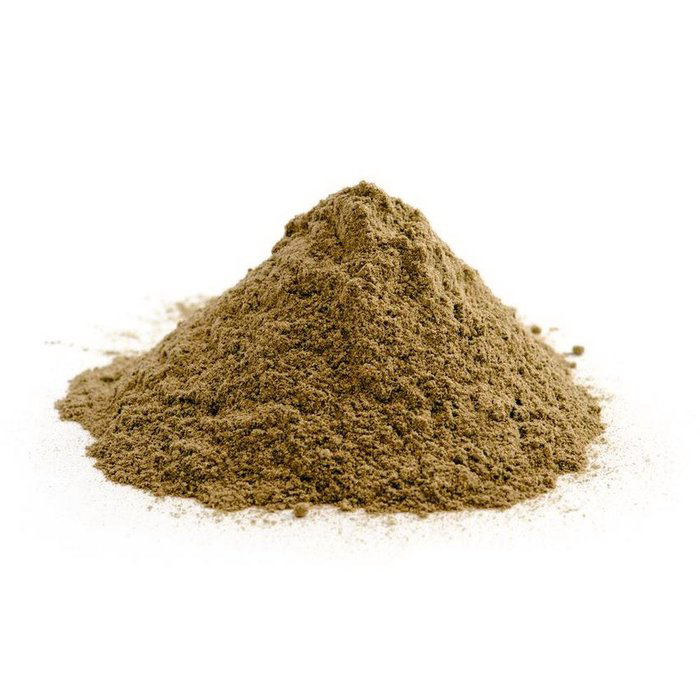 Herbal preparation provides a higher concentration of diosgenin, allowing for better and faster absorption of wild yam’s for soothing PMS symptoms and protecting liver function. Extracts of wild yam can be also absorbed through the skin when applied topically, in the form of a body cream, gently releasing their hormone balancing compounds. Supplemental form of wild yam is taken to stimulate female fertility, as well as for the relief of premenstrual syndrome (PMS) and menopause symptoms. Root should not be stored for longer than 1 year, since it is likely to lose its medicinal virtues. While there are over 600 species of wild yam, only 12 are edible. 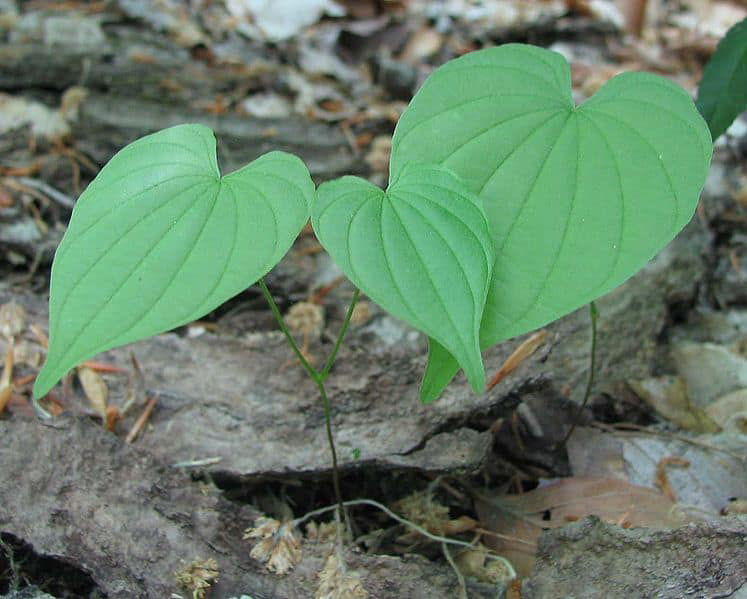 Diosgenin found in wild yam was used to make the first birth control pills in the 1960s. Use of the fresh plant can cause vomiting and other side effects. Known to cause headaches, menstrual irregularities & acne. May cause hair loss & oily skin. Avoid in patients with cancers of the breast, ovaries, prostate & uterus. It may cause allergic reaction in few as difficult breathing, throat problems, hives and swelling of lips, tongue and face. Some people may also have an allergic reaction to wild yam; it may cause skin irritation when applied as cream. Consuming wild yam can give rise to many allergic reactions like rashes or hives in some women. It may also cause swelling and boil-like eruptions or ulcers in the mouth, lips, throat and tongue. Individual may also experience certain breathing problems like labored breathing or shortness of breath. Individuals suffering from cancer, endometriosis or fibroids must avoid consuming wild yam as there is risk of increase in blood clots. It is a popular root vegetable. It is usually consumed boiled, steamed, baked or fried.